Women who want to learn the “Xs and Os” of the game of football, as well as the meaning behind those hand signals given by the referees, will be taught all of that and more during the third annual Football 101: Chalk Talk for Women on Thursday (Aug. 27). The clinic will be held at 6 p.m. in the Ron Randleman Strength and Fitness Center, located next to Don Sanders Stadium. Hosted by KSAM radio’s Brooke Addams, the clinic will feature football lessons from the SHSU coaching staff, including head coach Todd Whitten, a tour of the facilities and dinner and drinks. Participants will learn the different responsibilities of the offense, defense and special teams; have an opportunity to run out on the field just like the football team does on game day; and obtain instruction from coaches on throwing, catching and other elements of the game, as well as meet some of the Bearkat football players. The event is a partnership with State Farm designed to teach women the basics of the game of football in a fun, social environment. Registration is $20 per person or $140 for a table of eight, which includes dinner and other items from SHSU and State Farm. On the day of the event, a single registration is $25. To make a reservation, call the Bearkat Athletics Office at 936.294.4205. The SHSU Army ROTC Bearkat Battalion will show potential cadets what it means to be “Army Strong,” while informing students of the benefits of being a part of the program, during an open house on Wednesday (Aug. 26). The event, which includes free food, a jousting pit and a rock-climbing wall, will be held from 2:30-4:30 p.m. between Academic Buildings III and IV. Students interested in potentially joining the battalion can speak with cadets, tour the facilities and learn about scholarship opportunities within the ROTC, which can include paid tuition and fees, a book stipend and a tax-free monthly stipend for contracted cadets, according to retired Maj. Darryl Derr, ROTC recruiter. In addition, students who participate in ROTC learn leadership styles and to develop their own style through being placed in leadership roles and evaluation. The curriculum includes military history, military ethics, communications, customs and traditions, and uniforms. “The cadets receive classroom and field instruction on these basic techniques,” Derr said. “We also challenge the cadets with obstacle courses, rifle marksmanship and land navigation. The SHSU Alcohol and Drug Abuse Initiative will introduce students to the services it provides and invite students to get involved with the organization on Wednesday and Thursday (Aug. 26-27). “Find Out the FACTS about the Alcohol and Drug Abuse Initiative” will be held from 10 a.m. to 2 p.m. on both days in the Lowman Student Center Mall Area. During that time, students can visit an informational table to learn how to become a certified peer educator, volunteer with the organization and be a part of the committee. The ADAI is a multidisciplinary group composed of faculty, staff, administrators, and students dedicated to ensuring the safety and health of SHSU students. The coalition hosts a number of programs throughout the year designed to raise awareness related to and reduce abuse of alcohol and drugs among SHSU students. Programs the group hosts throughout the year include iDrive, a designated driver incentive program; Six Weeks of Alcohol Awareness Training, comprehensive alcohol education presentations; and the National Collegiate Alcohol Awareness and Reducing Irresponsible Drinking and Drugs weeks, which include interactive exhibits and educational seminars. For more information on the ADAI, visit http://www.shsu.edu/~org_aai/. An exhibit of photographs, illustrations, artwork and text will explore what the Alamo means to Texans and the role of Mexican-Texans in the Texas Revolution. “Alamo Images: Changing Perceptions of A Texas Experience,” organized by the DeGolyer Library of Southern Methodist University in Dallas and produced by Humanities Texas, will be on display in the Katy and E. Don Walker Education Center Atrium Friday (Aug. 28) through Sept. 25. The exhibit was developed “as a means to promote ongoing dialogue about the significance of the Alamo as a Texas experience, as seen through its various representations in popular culture,” according to Casey Roon, Sam Houston Memorial Museum curator of exhibits. Humanities Texas, the state affiliate of the National Endowment for the Humanities. develops and supports diverse programs across the state, including lectures, oral history projects, teacher institutes, museum exhibitions and documentary films. For more information, contact the Sam Houston Memorial Museum at 936.294.1832.or visit www.samhouston.memorial.museum. 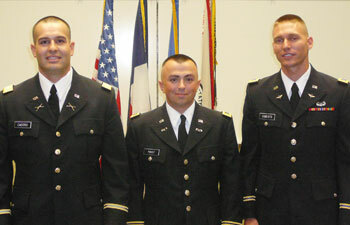 (From left) Second lieutenants Justin Castro, Addison Poust and Travis Roberts received their U.S. Army rank during the summer Bearkat Battalion Commissioning Ceremony on Aug. 8. Three recent SHSU graduates were awarded the rank of second lieutenant in the U.S. Army during the summer Military Science department’s Bearkat Battalion Commissioning Ceremony. Taking the Army Oath of Office in front of family, friends and other Bearkats were Justin Castro, Addison Poust and Travis Roberts. Castro served in the ROTC as a simultaneous membership program cadet in the Texas Army National Guard with the 124th Cavalry Headquarters and Headquarters Troop in Waco. While serving with his unit at the Joint Readiness Training Center at Fort Polk, La., he was awarded the Army Achievement Medal. The Waco native graduated on Aug. 8 with a Bachelor of Arts degree in political science and received a branch assignment to military intelligence with a branch detail to infantry. His first duty assignment will be at Fort Lewis, Wash.
Poust received a two-year Army ROTC scholarship after successfully completing the Leader’s Training Course at Fort Knox, Ky. The El Paso native received his Bachelor of Science degree in criminal justice and received a branch assignment to military intelligence with a branch detail to Chemical Corps. His first duty assignment will be at Fort Bliss. A Grand Prairie native, Roberts served in the ROTC through the simultaneous membership program with the Texas Army National Guard’s 2/149th General Support Aviation Battalion in Grand Prairie. Sam Houston State University’s College of Criminal Justice and its faculty are among the most published book authors in the nation, according to a recently-published study completed by CJ professor Willard Oliver and three doctoral students. “Book ‘Em Dano: The Scholarly Productivity of Institutions and Their Faculty in Criminal Justice Books,” published in the Southwest Journal of Criminal Justice (Vol. 6, No. 1), found that the College of Criminal Justice is ranked No. 6 overall, but moved to No. 4 when the weight of publishing was divided evenly among multiple authors and No. 3 when more weight was given to the first author, meaning CJ often takes the lead in multiple-author CJ books, Oliver said. Additionally, five CJ faculty and alumni were listed within the top 30 most productive faculty, including Larry Gaines and Craig K Hemmens, tied for No. 4; Rolando Del Carmen, No. 9; and Oliver and Jeffrey Walker, tied for No. 13. The study examined 586 publications in the field, written by 627 different authors from 305 academic institutions and 14 book publishers. The books ranged from student workbooks to textbooks to the publication of original research. Publications were assessed first by a raw number count and then weighted in a number of ways. The doctoral students who worked on the study included Sam Swindell; John Marks, Jr.; and Ken Balusek. The full text of the article can be accessed at http://utsa.edu/swjcj/archives/6.1/6%20SWJCJ%206(1)%20Oliver%20et%20al.pdf. David Letterman, Brad Pitt, Mike Ditka and SHSU President Jim Gaertner are among its brothers. But long before any of those men became part of the Sigma Chi Fraternity, there were the founders. These men, the founders, are the ones Bill Fleming, English professor, executive director of the Student Advising and Mentoring Center and Sigma Chi brother, has chosen to feature in a new book that chronicles the 154-year history of the organization. 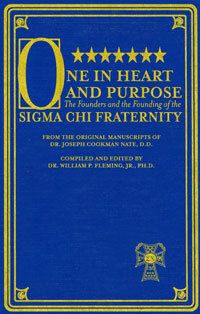 “One in Heart and Purpose: The Founders and the Founding of Sigma Chi Fraternity” details the fraternity in three parts, including extensive biographies of the seven founders; the founding of the group from several perspectives, such as plays by Pulitzer-Prize winner Martin Flavin and a parody by a founder; and “In the Spirit of the Founders,” comprised of information about the founders’ memorials, from diaries kept during the Civil War, and complete listings of Significant Sigs, as well as other notable members. The book, which includes illustrations by master cartoonist Milton Caniff, is available through the Sigma Chi Fraternity Web site at https://payment.sigmachi.org/foundersbook. Rafael Saumell-Muñoz, professor of Spanish, has been accepted into the North American Chapter of the Royal Academy of the Spanish Language at the rank of collaborator. Saumell was selected for the title after two members of the academy presented his dossier to the director, Gerardo Piña-Rosales, and the governing board, which evaluated the dossier and then welcomed him into the institution. As a “collaborator,” Saumell can participate in all forums and discussions pertaining to the academy but does not have voting rights, he said. Founded in 1973 and based in New York City, the ANLE is a part of the 22 Association of Academies of the Spanish Language. The two other categories of members are number academics and corresponding academics. 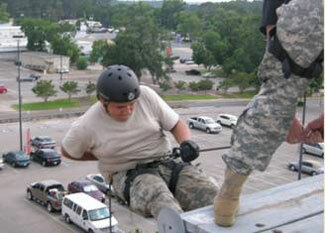 Retired Lt. Col. Alan Mooneyham (right), former head of SHSU’s Military Science Department, instructs Sam Rayburn High School sophomore cadet Roberto Orozco on how to rappel off of the Farrington Building roof during a recent training camp on the SHSU campus. Twenty-six junior ROTC cadets from Sam Rayburn High School in Pasadena learned the college ropes and participated in military training during the JROTC Leadership Camp on the Sam Houston State University campus June 22-25. This is the third consecutive year the high school students have come to SHSU for the camp, which included bivouacking and using the ROTC facilities to participate in the obstacle and leaders’ reaction course at Gibbs Ranch, as well as conducting land navigation and practicing basic leadership, according to retired Lt. Col. Alan Mooneyham, SRHS JROTC instructor and former head of SHSU’s Military Science department. The JROTC cadets also had an opportunity to spend some time on campus during freshman orientation and at the Visitor Center and the Health and Kinesiology Center. The event was hosted in large part by Lt. Col. David Yebra, SHSU Military Science department chair. The 26 JROTC cadets were selected from over 250 other cadets from the Rayburn JROTC program, according to Mooneyham. Mooneyham and Yebra said this event is a win-win opportunity for both SHSU and Sam Rayburn. “The leadership camp teaches basic leadership and self-discipline, while conducting it at a great university campus like Sam exposes high school students to an achievable alternative after high school,” Mooneyham said. In addition, Yebra awarded each of the cadets with their camp completion certificates, recognized 12 for earning the RECONDO badge, and extended an invitation to SRHS again next summer. The Communications Office is now collecting information on campus events for its fall calendar pages.